I realize that spying on the competition may not seem to be of great importance when taken as a stand-alone SEO concept without understanding what you can actually glean from doing so, or knowing what insights the available tools can offer. This post will try to demystify the issue. Competitive intelligence can tell what phrases your competition is effectively ranking on, and what they aren’t, providing you with additional guidance as you plan your organic and paid search strategies. · Check out your top online competitors. · Check their title tags, META data, headers and primary targeted terms. Make a list of terms for which they appear to be optimizing. · Run the terms they are ‘optimized’ for through Google and see if they rank in the top 10 (or 30). Make a note of the terms they actually rank for. · Then run their URL through SEODigger.com. For example; if you are a Sushi restaurant in Chicago, SushiWabi.com is a direct online competitor. SEODigger.com will show you (depending on data centers and other impacting factors, but it’s not a bad guide) what positions this site holds in Google, and for what terms. · Then run their URL through SpyFu.com. If you are a subscriber, their results are more comprehensive. The free tool is not a bad quick check on SEODigger for organic results, but is more useful for seeing their Paid Search terms. Which we look at in the Paid search step below. · Run the list of ranking terms through Wordtracker, Google Keywords, KeyWord Discovery, Suggest tools on the various search engines. · Make a list of the top 20-50 terms on each keyword research resource you use (use at least 2 or 3 to take into account variations and discrepancies). · Check out your top offline competitors, especially if your business is offline based or has a strong offline market. If your offline competitors are the same as your online competitors it makes life a smidge easier, but it is not always the case. · none of the plumbers mentioned in my online list from my first selection are mentioned. Incidentally the iYP search yields nearly the same results. This is indicating that the top offline listings with their big YP ads are hitting the iYP advertising as well… Anyone ever tell them about SEO? I reckon iYP is keeping it close. They can’t really take to SEO can they… way too much conflict of interest. · Take these top offline competitors and run them through Google looking to see if they have websites, and if they have, what they are optimized for. If you are not optimized, you may see some strong relationships between their site and yours in terms of what is being missed. It’s a nice way to view a poorly optimized site and figure out why they are not working when compared to competitors that are – almost a DIY audit on the competition. You can request that your SEO Consultant do that for you as extra data for future development. · Take the data gleaned from SEODigger. · Look at the PPC data from SpyFu.com. For a better example I’ll look at a restaurant that is advertising via PPC (I can only see those advertising across North America and including Canada in their geo-target). Let’s look at OliveGarden.com. 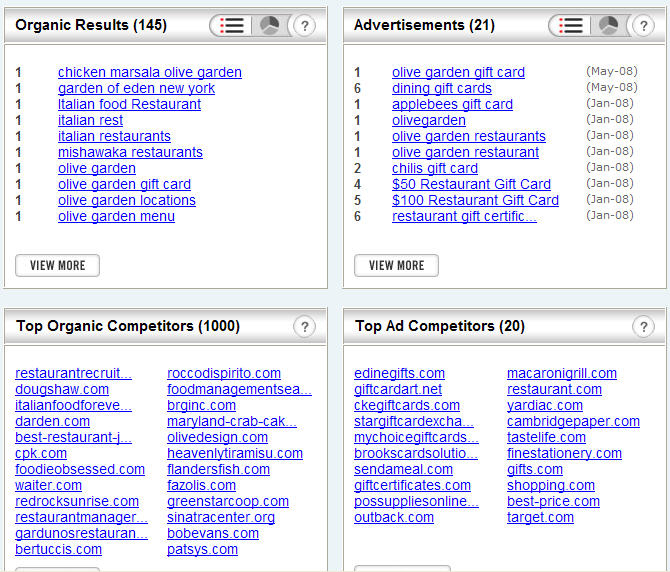 o This site has a lot more traffic, and the image shows organic data on competitors as well as search terms. Paid subscription yields more data, but for this exercise this is sufficient. · SpyFu is super easy to use, and free as you figure it out. I highly recommend it. · Take all the keywords you have, from organic research as per steps 1&2. · Take the terms you have gathered in excess left over from your IA and copy team for SEO site plan. · Take the terms you found from PPC competitive insights and run them through the keyword research tools to get variations. · Make a final trim and split the keywords into a usable, adgroup and keyword targeted PPC campaign. Note on brands targeting other brands… Some brands have ‘gentleman deals’ not to target other competitor brand names in the PPC results to keep PPC costs down. If they work, it is of enormous benefit to all brands concerned. In most cases this is not the case. HOWEVER, my advice is to type your brand and variations of it into Google and see who’s advertising in the paid results via SpyFu (or more advanced AdGooroo – there are a huge number of software solutions out there, I personally know these two and recommend them both). Contact them and request a mutual cease and desist on brand name terms. If they are amenable, get a document from both/all parties listing the brand name terms they want kept ‘free’. Review all terms individually and then collectively and form a ‘brand exclusive’ partnership. As soon as you can get something off the ground, the collective is likely to have the combined power to absorb new *brand stealers*, or negate their opportunity to capitalize on your grouped name terms. · If you know what initiatives your online competition is engaging in, or what issues are befalling them you can combat them immediately via PPC initiatives, and long term via SEO. · For example; if a competitors is having financial issues, or board in-fighting, if they are closing stores or opening new ones, you can be among the first to know via reputation monitoring and management. · You can use the information to create targeted PPC campaigns, and create long term competitive, combative, or superior pages. You can use the information to create a new niche, extend a niche, or as an idea for your own product or service development. The possibilities are virtually limitless. · A great free tool is Google Alerts. Easy to set up, and easy to monitor. Whatever ‘term’ or ‘brand’ you enter will be monitored and emailed to you if you choose it to be an ‘alert’ any time that ‘term’ is included in a Google news, web, blog or other result. · Two superb paid for tools include TruCast (a social media and blog monitoring solution from VisibleTechnologies) and TrakUr (Google Alert on steroids according to it’s creators). Monitor your competition online and off. See what they are doing and strategize reactively, and proactively depending on what you find!